St Croix is an unspoiled dream. White sandy beaches and lush rainforests set the scene for tropical bliss. Enjoy the historic old-world charm of Christiansted and Frederiksted, sip your way through a tour of the Cruzan Rum Distillery or explore the ruins of a old sugar plantation. Go horseback riding along stunning white beaches, hike through rainforests, eat fresh seafood every night. 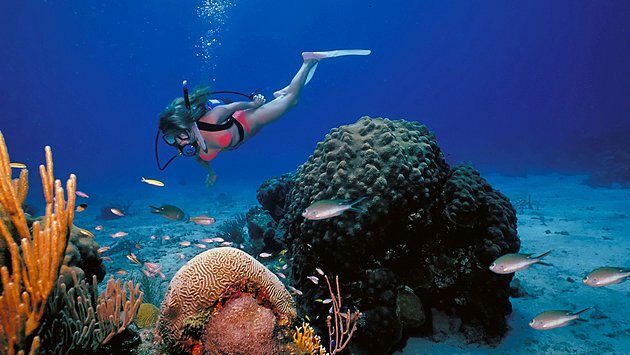 And the scuba diving is superb. Experience shipwrecks, manta rays and sea turtles, swim in giant schools of tropical fish, and soon you’ll be thinking: why be anywhere else? 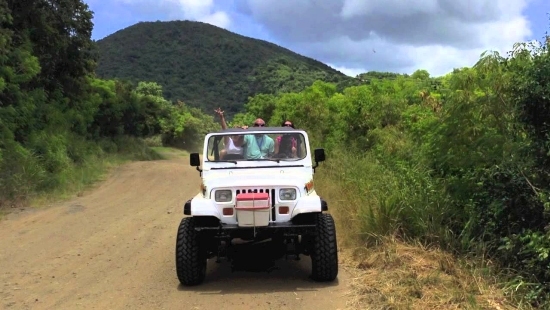 St Croix offers a wondrous escape from crowds found at other Caribbean destinations. Here you won’t have to fight for a place on a crowded beach; often you may be the only person on the beach. Strict development limits means you won’t see overbuilt hillsides full of apartments and condos. In many ways it remains just as pure and inviting as when Columbus found it 500 years ago. Getting here is easy, and while U.S. citizens don’t need a passport, it’s good to bring it or a copy of a birth certificate as proof of citizenship. 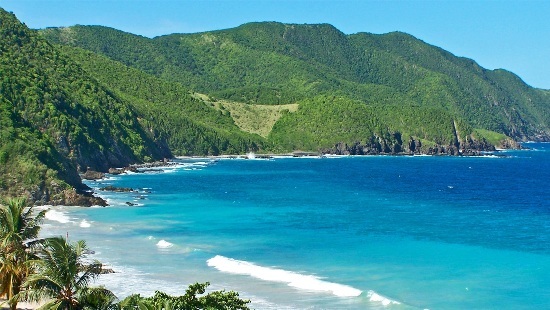 St Croix is the most eastern and largest of the U.S. Virgin Islands (28 miles long, 7 miles wide), located 40 miles south of St Thomas and St John. It is one of the most beautiful resort areas in the Caribbean. Much of its beauty and charm lies in gently rolling hills, stretches of pristine and uninhabited beaches, and exceptional variety of landscapes, from lush rainforest mountainsides to the dry, desert-like areas, studded with flowering cactus. 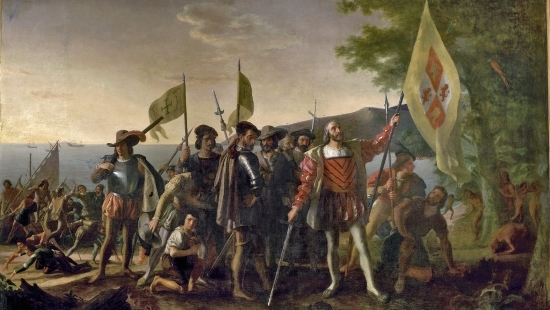 Columbus and his crew landed a mere 300 yards from Villa Margarita, at Salt River bay on his second voyage across the Atlantic Ocean in 1493. We literally are walking in their footsteps! Since then, St Croix has been owned by Spain, France, Holland, England, the Knights of Malta, Denmark and the United States. This gives the island an easy mix of different cultures and styles, a bit of Old Europe in the Caribbean preserved in the two main historic towns of Christiansted and Frederiksted. It’s an amazing place to feel as though you’re travelling through centuries of history without leaving the present. Cruzans (also called Crucians), the people of St Croix, are known as the friendliest of any Caribbean people. The locals speak English, Spanish and Creole, commonly called Calypso. Creole began in the early days of the slave trade and was influenced by French, English, Portuguese and Dutch mixed with African. Cruzans love to celebrate, with many unique holidays year-round. December-January is packed with various celebrations, with Three Kings’ Day parade as the high point of every year’s Crucian Christmas Festival. Monthly jazz festivals on the beach and a local Mardi Gras parade in February are also key events on the calendar. 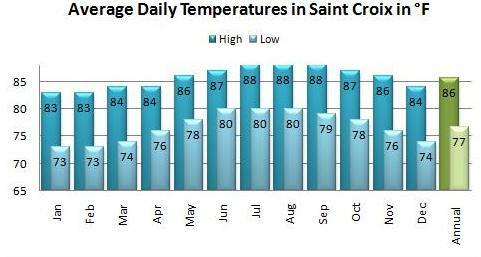 St Croix’s perfect year-round weather is legendary. Located close to the equator, the average temperature ranges between 75-85°F. Constant trade winds blowing gently across the island keeps summer temperatures reasonable and humidity low. Tourists are often shocked to learn that summer is only 5°F warmer than winter! Hint, hint: a great reason to take advantage of our summer and fall discount rates! Summer clothes are worn year around. Simple cottons and linens keep you coolest, and sandals are the footwear of choice. While the island’s style is casual, bathing suits are not appreciated off the beach. Virgin Islanders also like to dress up, so keep it in mind if you go to a special event. While taxis are available all over the island, we recommend you rent a car. There is so much to see and do, and having your own transport allows you to capture it fully. And don’t forget: we drive on the left side of the road here. Rental cars are available at the airport and also in Christiansted and Frederiksted. We appreciate if you support local-owned businesses like Judi of St. Croix. The US dollar is the accepted currency in St Croix. We have banks, ATMs, Western Unions and most businesses accept major credit cards. 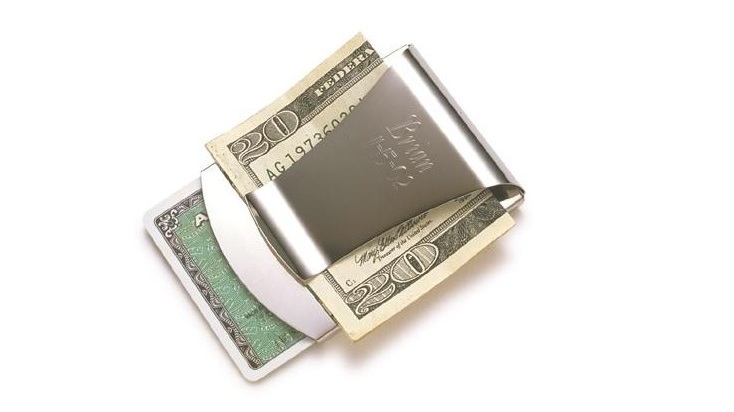 You should carry a small amount of cash, however, as there’s always drinks, street food, small gifts, tips, etc. There is no sales tax in the Virgin Islands (yeah! ), but a 10% government tax is applied to hotel rooms. 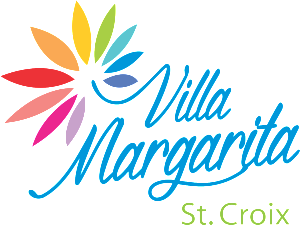 St Croix has duty-free status which means each visitor can bring back up to $1200 of purchases duty-free.